And excellent big cat sighting and kill turned up recently in the UK which is very similar to Australian big cat kill sites. On the night of June 16th 2001, journalist Ralph Barnett was driving home from Dundee to Cupar (north-east Fife, Scotland). As a journalist, Barnett has admitted familiarity with the subject of ABCS, and in particular with the ABCs of Scotland, but he had no special prior interest in the subject. On rounding a bend and coming out of a slight dip in the road, he switched his headlamps to full beam. What he took to be the headlamps of another car immediately ahead caused him to undertake an emergency stop, but it wasn’t a car in front of him, it was – so he reports – a big dark-coloured cat. It leapt away out of sight, and as it did Barnett realised that it had been feeding on the carcass of a Roe deer Capreolus capreolus, still lying there in the road. Barnett called the local police on his mobile phone and they ‘attended in significant numbers – certainly more than would normally be available for a disturbance in Cupar town centre at that time on a Saturday night’. The police elected not to retain the carcass and it was unfortunately dumped at the roadside and left there, but Barnett took excellent photos, all of which have been posted on the Scottish big cats website. 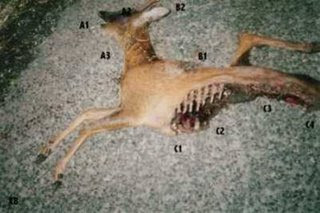 A detailed description of the carcass was posted to accompany the images, and after being asked questions about the carcass by several ABC investigators Barnett supplied further additional details.As seen in the accompanying close-up, the deer seems to have been killed by asphyxiation. This is evidenced by bulging eyes, an open mouth with protruding tongue and clotted blood pooled on the side of the face. The eyeballs were ruptured and still moist. A series of sub-parallel lacerations on the side of the neck look exactly like claw marks (and were interpreted as such by Barnett): they were deep grooves incised into the neck.